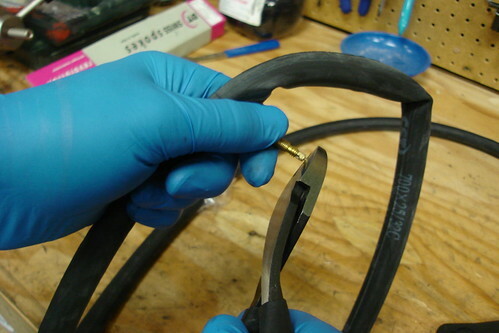 For the most part putting Slime into presta valves was a bit of a mystery for most consumers. But you’d be surprised to know that you could actually get it done for half the price it would have cost to buy 1 pre-Slimed tube. 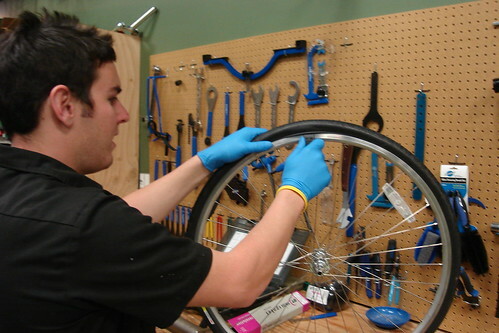 I went back to Jax Bicycle Center in Fullerton to get some advice from Scott Moore, a resident mechanic of the shop. 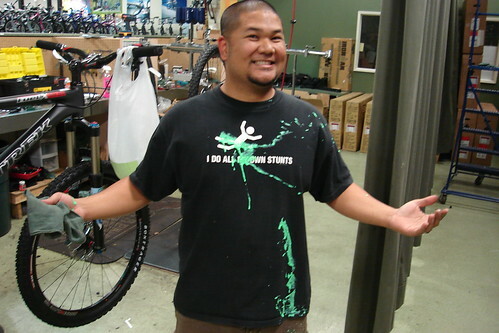 He was able to show me how they Slime presta tubes at the shop. We used the Redline 925 as the test subject. First things first, remove the tube from the wheel. Keep the valve closed and take some pliers and cut the very tip of the valve. This next step is the most crucial part. 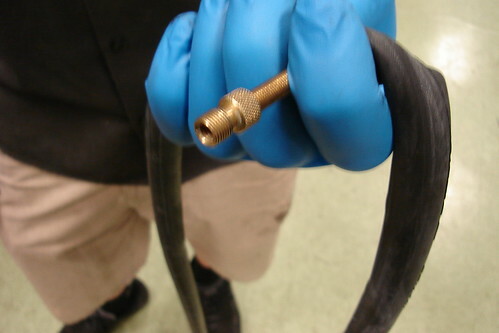 Place your thumb below the valve to prevent the needle from falling into the tube. Hold the pin in place during the whole time. If you lose the valve in the tube, it could mean you buying a new tube. 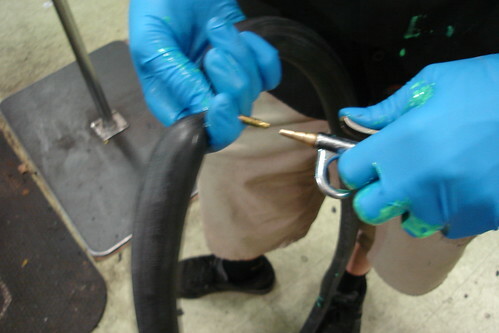 Since we’re at the shop, we used the Slime pump to fill the tube up with the green stuff. Don’t hold the pin too tightly. If it’s too tight, you can get Slimed from the back pressure. If you’re doing this at home, you can still use a bottle of Slime for this project. Just simply fill your tube as the direction states. But remember, don’t let go of the pin! Now here’s the magic of it all. 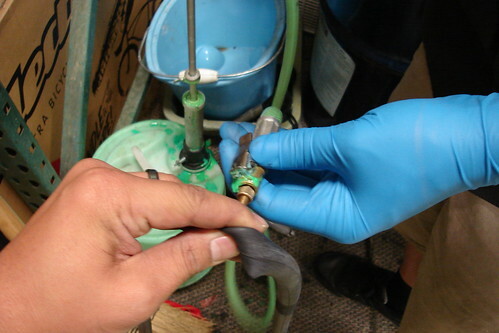 Once you’ve got enough Slime in there, blow pressurized air into the valve. See how Scott is still holding the pin. What happens after the tube gets enough air, the pin will shoot forward, making it visible. 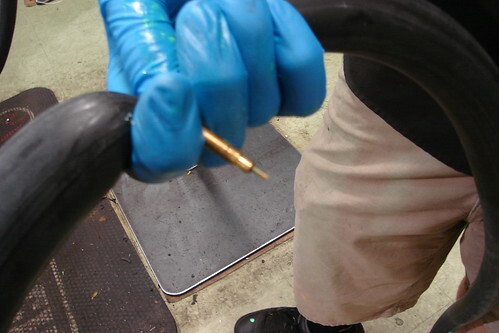 Here’s a shot of the pin out of the valve stem after getting air in the tube. Then what you want to do is grab your pliers, hold the pin, then screw on the valve top. Mount the tube back in to the wheel, fill it up with air, and you’re back in business! Just keep in mind that the valve head can screw off completely. So when you need to fill it back up with air, just don’t unscrew it all the way. Thanks again to Scott Moore fo Jax Bicycles of Fullerton. Cool to see someone else doing it! We have been doing it for years. However we do not find it necessary to clip the end of the valve with dikes. We just gently clamp vice grips on the nut and unscrew it. Needle nose vice grips work well, that way you can keep track of it. We also like to let the valve “fall” inside but we pinch it between our fingers inside the tube as it cannot get “lost” because it is inside the tube! We have occasionally “lost” it but it is not hard to find. The rest of the procedure is the same. Nice to see other smart folks out there that like tire sealant. 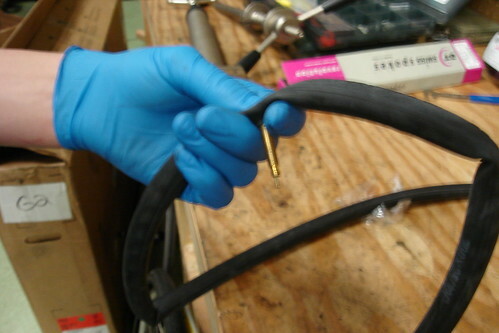 We have heard customers tell us that other shops told them they could not patch a tube with sealant. We also use Slime. Wouldn’t it be a lot easier just to carry an extra tube? Slime makes such a big mess anyways when you get a big puncture from something like a screw ect…. I use Continental tubes. They have removeable valve cores, which would make the whole procedure much simpler. I also did not clip the tip of the valve, but I had to force the pin into the tube with a toothpick before I can grab it…. for some reason there is something there in my tube that prevents the pin from falling into the tube. I just unscrewed the nut with with pliers instead of cutting it off. I forgot to re-install the nut before inflating the tube and it came out of the valve and I had to use my fingers to manuever it back into the valve, then I put the nut back on and inflated the tube. I put about 2 t o 3 ounces of slime in each 700cx23 tube. The Slime website says to put 4 ounces in bicycle tires, they dont say how much for different size tubes though. I also used pliers to undo the nut and then tied some thread to the valve before dropping it into the tube , it was then an easy task to retrieve the valve after having pumped my green goo in there. Forget Slime! ; its organic nature leads to fungus growth, detioirates rubber and is a mess! Go Ride-On for the win! I just TRIED to follow the instructions on Slime’s website for presta valves. I say TRIED because it was not physically possible. There is no ‘tapered funnel opening’ in the top of the bottle. It is untapered and so you cannot screw the valve threads into it. I had to wrap the threads with teflon tape to get somewhat of a seal. Next I had to poke the shaft into the tube with a toothpick and keep stopping and doing that so I could get a small amount of slime in there before it blocked up the valve with a wad of fibers. Finally, even though I tied a thread to the end of the shaft as suggested here, I could not get the shaft out again. This was a heavy duty thorn proof tube so I can’t feel the shaft in there at all to manipulate it into the valve stem. I will not waste any more time with Slime. I will get a $50 kevlar tire and another heavy duty tube. That should work better anyway. Update. After throwing the mess I made aside and going back to it the next day, I finally got the shaft into the valve stem. I noticed that the thread moved ever so slightly when I pinched the tube on one side of the stem and not on the other side. This was very subtle but it was noticeable. It’s kind of like watching your leader when flyfishing nymph patterns for all you flyfishers. I cleared the stem with an allen wrench handle and I tilted the valve stem end away from the side that the shaft was in. I gently tugged the thread a few times and, presto, the shaft fell into place. I was then able to pull it down enough to thread the knurled nut onto the shaft and was able to inflate it no problem. Problem solved. I take it this is the worst case scenario of getting slime into a presta tube so maybe others in the same situation can benefit. I injected slime into my schrader tubes by folding the tube so that there was a “corner” and cutting off the very tip so that there was a tiny hole in the tube. I then pushed the slime bottle tip into this (the hole had to stretch) to fill them up and finished the job with a patch! My tubes have been fine and they must have been in for 2 years or more. I ride most weeks off road so they get some abuse too – can’t complain! Slime has pros and cons, and I prefer tuffy tape for my commuter bike or puncture resistant tyres. But for training cross country and riding a lot of bridleways where thorns are common I think slime is the way to go. Slime has saved me loads of time fixing punctures (at night) on the trail. I then tend to inspect my tyres at home where I can fix any holes out of the rain and in the comfort of my garage with the radio on. Did the presta slime thing as outlined in the article/pictures, except with the bottle of slime, and utilizing the presta insert from my Joe Blow pump to adapt to the slime tube (that is sized for schrader valves). Joe blow piece usage ended up resulting in sliming the kitchen (where I was performing bike maintenance), but it did work. I need to purchase the adapter, or it would be nice if Slime provided one for presta (adapter or tube size…what ever). The sliming was mostly due to the high squeeze/pressure I had to apply to the bottle to get some flow going. Actually loosing the presta insert in the tube aided in getting flow going. So on second tube I just lost it and then found it and stuck it back in place. Not a big deal. Good luck! Was just researching tube sealants and can across these great instructions. 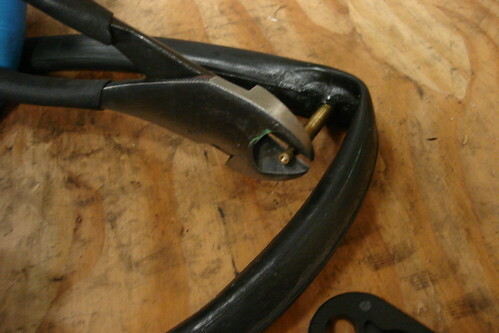 From the Stan’s website they recommend unscrewing the top brass thumb screw with pliers. After assembling the core, they recommend you take a pair of pliers and on the last few threads gently squeeze the threads to damage them so the brass thumb screw will not fall off. Will try these steps tomorrow. Thanks! Did exactly as instructed above, however I let the valve fall inside the tube (Easy enough to find again). The problem came when I pushed the valve back in from the inside. The threaded valve stem seemed to have broken in halve and was then too short. Tried the same procedure on my other tube and exactly the same???? Had to throw both tubes away.